Will my health or my child’s health be affected and should we see a physician? How can molds affect your health? How do molds get inside the home? How do they grow? If I am building a new home, how can I protect it from growing mold? What should I do if I find mold in my home or apartment? Who can I call if I suspect I have a mold problem or if I want more information? I just moved into a new home and I think I have mold. How can a “new” building have mold problems? I looked at my insurance policy and mold is not mentioned once. Do I have mold coverage? I don’t have a moisture problem in my home, why do I have mold growing? Q: Will my health or my child’s health be affected and should we see a physician? A: If you believe that you or your children have symptoms that you suspect are caused by exposure to mold, you should contact your physician immediately. Keep in mind that many symptoms associated with mold exposure may also be caused by many other illnesses. You should tell your physician about the symptoms and about when, how, and for how long you think you or your children were exposed. Q: How can molds affect your health? A: The most common types of mold are generally not hazardous to healthy individuals. However, people who have asthma, hay fever, weakened immune systems, common allergies or who are very young or are very old are more likely to react to mold. The most common symptoms are running nose, eye irritation, cough, congestion, and aggravation of asthma. A small percentage of the population can develop more serious effects — such as fevers and breathing difficulties — but these effects are uncommon. Some types of mold can cause more serious health problems. If at any time you think your health may be suffering, please contact your physician immediately. Q: How do molds get inside the home? How do they grow? A: Molds naturally grow indoors. Mold spores may also enter through open doorways, windows, heating, ventilation, and air conditioning systems. Spores in the air outside also attach themselves to people and animals, making clothing, shoes, bags, and pet’s convenient vehicles for carrying mold indoors. When mold spores land on places where there is excessive moisture, such as leaks in roofs, pipes, walls, plant holders or where there has been flooding, mold will grow. Many building materials provide suitable nutrients that encourage mold growth. Wet cellulose materials, including paper and paper products, cardboard, ceiling tiles, wood, and wood products, are particularly conducive. Other materials such as dust, paints, wallpaper, insulation materials, drywall, carpet, fabric, and upholstery, commonly support mold growth as well. Q: If I am building a new home, how can I protect it from growing mold? A: EnviroShield offers a proactive treatment with a 25-year warranty that is applied during construction to prevent mold growth. Contact us at 866-222-1775 for more information. Q: What should I do if I find mold in my home or apartment? A: Do not touch, scratch or wipe at it as this will only spread the mold to other parts of the home or building. Contact a Certified Indoor Environmentalist to perform a mold inspection. Mold tests can be conducted by any environmental consultant and/or analyzed by a laboratory specializing in microbiology; however, these tests can usually be very expensive — from hundreds to thousands of dollars. At EnviroShield, we have developed a standard process to determine the magnitude and location of mold problems quickly and affordably. Q: What is mold and where is it found? 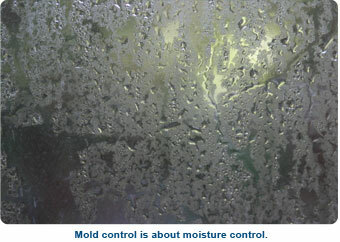 A: Molds (fungi) are present EVERYWHERE -indoors and outdoors. They serve an important, positive role, by helping to break down organic matter. Without them we would be knee deep in garbage. There are more than 100,000 species of mold. Some of the most common molds are species of Cladosporium, Penicillium, and Aspergillus. Mold is most likely to grow where there is water or dampness — such as in bathrooms and basements. Q: Who can I call if I suspect I have a mold problem or if I want more information? A: For more information about the health effects of mold exposure and information on the safe removal of mold, please call EnviroShield at 866-222-1775 and speak with a Certified Indoor Environmentalist. Q: I just moved into a new home and think I have mold. How can a “new” building have mold problems? A: There is no guarantee that new homes are mold-free. Mold enters a new home in the same way it would enter any other building. The only difference is the building may be exposed to water during construction and if that occurs, mold can begin to grow within 24 hours. If you think your home has mold, contact EnviroShield at 866-222-1775 to perform an Inspection. Q: I looked at my insurance policy and mold is not mentioned once. Do I have mold coverage? A: Even if your policy appears to exclude mold as a covered risk, you may be able to make a claim based on the water damage as a direct result of water intrusion like a sudden water pipe break or rupture of a water tank. Q: I don’t have a moisture problem in my home, why do I have mold growing? A: Even though you might feel like you don’t have a moisture problem, just like mold, moisture is everywhere and is also hard to control. Even though you might not have a leaking pipe or a flooded basement, due to changing temperatures inside and outside homes and buildings caused by heating and cooling, condensation can form in many places which can then lead to mold. The best way to prevent mold is to eliminate moisture, control humidity and make sure you have adequate venting and circulation. Q: How can you be exposed to mold? A: When moldy material becomes damaged or disturbed, spores (reproductive bodies similar to seeds) can be released into the air. Exposure can occur if people inhale the spores or directly handle mold-containing material and accidentally ingest it. Some molds can produce chemicals called mycotoxins. Mycotoxins may cause illness in persons who are sensitive to them (for example, persons who are prone to allergies) or when persons are exposed to large amounts in the air (typically associated with certain occupations). Q: Should I use bleach to remove mold? A: You may but there are some concerns and safety precautions. Chlorine bleach produces off-gases after it is applied. Chlorine off gassing can be harmful and may cause pulmonary embolisms in some people. Chlorine will “flash” or dissipates preventing sufficient contact to kill the mold hyphae or roots. Some bacteria and fungi need to be submerged for a minimum of thirty minutes to be killed. Chlorine, because it “flashes,” evaporates faster than its water base leaving moisture in the contaminated area, which encourages and supports mold growth. Additionally, chlorine will accelerate the deterioration of the material it is applied to and wear down the fibers. Bleach is also 99% water, which is one of the main contributors to the growth of harmful bacteria and mold. Current experiments where mold was treated using bleach, allowed mold to regenerate faster and more densely than the original colony. As a result of bleach being used, there are some mold strains that are resistant to chlorine.